My educational focus for the last few months has been on CLOUD I recently completed my AWS exams and now I am working on getting Azure certified. To my delight, EDX/Microsoft has paired up for a certification program with an awesome concept rather than just take the test and saying hey I’m certified you take and need to pass 11 courses. One of them being a large project that applies your knowledge in a hands-on manner!. I’m not hiring a manager but I think this is much more valuable than a piece of paper saying you’re certified. Check the following link for the Microsoft/EDX professional program in Cloud administration. Here is the Microsoft link to the program details. You start off with the basics on Azure like what cloud concepts it supports and what types of services Azure provides and offers. If you are new the cloud computing concepts many of them are relatable to the legacy knowledge you may already have. Some are totally new and one of the best things is that the course has a free track but you won’t get the certification. You have to pay for the certificates to get the professional program certification in administration. Also paying for the certificates helps keep EDX alive and I don’t mind spending some money I’ve learned so much from this site!!. Which is available both on the free path and the paid for the path, in the end, it’s about the knowledge taken out of the courses. But if you are applying to a company with the old way of thinking that certs are everything you may want to pursue the certification. 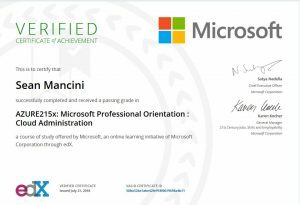 You also get a certificate for each step of the way to show employers you have learned a new concept about cloud from EDX then after passing all of the exams and courses you apply for the Microsoft one. also gets you set up for later labs and courses. It talks about how to set up your azure account and stuff like that. Here are the skills you should expect to learn after finishing the entire program. Each course has exams and practical assignment at the end and the certificate will detail all of the work you did. So much more valuable than a traditional certification in my mind. Hope this article helps you on your cloud journey!